John Tye was born in Toronto Ontario in 1879. Between 1899 and 1902, the Boer War raged throughout South Africa. John felt that it was his duty to enlist in the First Canadian Expeditionary Force stationed in Africa. He served his country for three years including a two year service in the South African Constabulary under British army officer Robert Baden-Powell. John returned from the war in 1903 and married Alice Tansley. He worked for the Canadian Northern Railway and finally settled in Capreol in 1922. John and Alice had a son John and a daughter Frances. John married Ethel Lulu Smith and they had two children John Jr. and Lual. Frances married Alois Plexman and they had one son Tye. Tye married Margaret Sawyer and they were blessed with four daughters Frances, Allyson, Connie and Judith. John Tye was very active in the affairs of Capreol. The Royal Canadian Legion, Capreol Branch 179 honoured John by awarding him with a life time membership. In the 1930's John was elected to five consecutive terms on Town Council. When John passed away in 1971, he was a member of the Brotherhood of Locomotive Engineers for an amazing 60 years. John was quite a character with a great sense of humor. 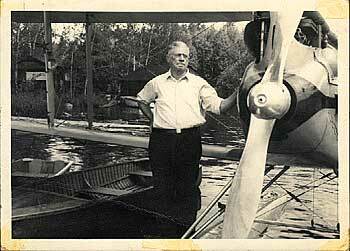 He once brought "Giant Bullfrogs" from one of his trips to Africa to his camp at Ella Lake. Well, the people in Capreol for years were talking about these "Giant Bullfrogs" that were hopping around Ella Lake Park. John was also a crack shot as I witnessed when I was a kid. He shot six beer caps in six shots off a fence when he was in his 80's. Tye and Margaret Plexman still live in Capreol and continue to stay at John Tye's camp at Ella Lake.